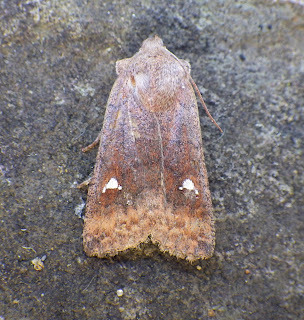 I put out one actinic in the garden last night (24/3), but I did not achieve the numbers or variety obtained by other Carmarthenshire moth`ers recently, with only eight species in the trap. Petty compensation was offered by a solitary satellite. I didn't trap in the end, I dithered about and decided it was far too windy, and at 4am the sky was clear. The rest of the week looks too cold, very slow start, but I saw a compensatory Orange Tip just now!